The Great Smoky Mountains National Park is one of the most visited national parks in the United State, and after you visit you’ll see why. There’s over 800 miles of hiking trails, majestic mountain views, and wonderful wildlife to see and explore in this park. Some hikes in the park can be strenuous and long, but very rewarding. Other hikes can be peaceful and easier to manage. No matter the skill level there is some place in the Great Smoky Mountains that will inspire you and leave you in awe. We’ve listed a few of popular destinations below, and you can look up more information about the national park here. The Island has a little bit of everything you’re looking for in a vacation, shopping, dining, and other popular attractions. You can spend an evening here wandering through stores and grabbing dinner at one of the delicious restaurants located on The Island. When night comes two of the best things to do at The Island is to either ride the Smoky Mountain Wheel or watch the fountains. The Wheel offers great views of Pigeon Forge from over 200ft in the air! The fountains are timed to music and special effect lights and have rocking chairs located around them so you can sit to watch and relax. You can learn more about The Island in Pigeon Forge here! The Old Mill is a historic landmark settled in the middle of Pigeon Forge. The mill, known as a grist mill, was built in the 1800s. It has a picture perfect waterfall flowing beside it that keeps the mill turning. At the Old Mill you can find the Old Mill Restaurant, the Pottery House, and small, quaint shops to look through. The Old Mill Restaurant serves break, lunch, and dinner. Their menu consists of Southern, comfort food. All made from scratch and fresh. The restaurant is beloved by visitors and locals. Learn more about The Old Mill and look through the restaurant’s menus, here! The village defines itself as, “stepping to the old world, off the parkway.” It is a small portion in Gatlinburg of unique shops that make up the Village. The ground is laid down brick, and the architecture of the buildings are European-themed. Here you can find delicious snacks and drinks, and unique souvenirs to purchase. This is also a great place to snag some pretty pictures in a beautiful setting. See what type of stores and cafes are at The Village here! Dollywood is a theme park named after the beloved country singer Dolly Parton. Her influence is all over the park with pictures and statues of butterflies and her music playing in the background. You can even see what her childhood home looked like, and visit her Coat of Many Colors museum. Throughout the rest of the park you’ll find over 40 amusement rides and 15 shows to see. The rides vary from gentle thrills for small children to award-winning, make your hair stand up roller coasters! There’s something here for everyone! Learn more about the rides, shows, and tickets here. 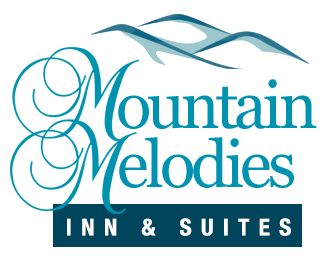 At Mountain Melodies you will be a short drive from all of these must visit locations! Our great location is just one of our many amenities that we offer. Take a look at our rooms today at our Pigeon Forge hotel, so you can start having the most fun possible in the Smokies sooner.